Yes, I have my moments, but fighting among ourselves when there is so much at stake does not make sense to me. There is no doubt that our taxes are too high but the amount going to help families in need doesn't amount to a hill of beans when compared with subsidies going to the oil industry and other major corporations. If we want to get angry about something, maybe it should be at the lack of consideration for the people of Canada. 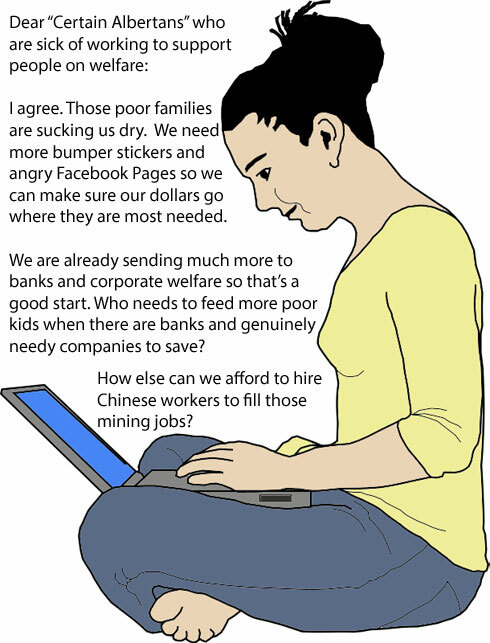 Maybe we should be angry about our vulnerability to foreign nations like China through badly structured trade agreements and irresponsible foreign worker/indentured servant laws. That's where billions of your tax dollars have already gone, and will continue to go - settling secret lawsuits. Our middle class is rapidly disappearing so before you slap on the old bumper sticker, just remember that under the current Harperist regime, tomorrow those 'poor people' are going to be you and your kids. United we stand and divided we fall. End rant.